Wonder what I’ll write about tonight? Me too. 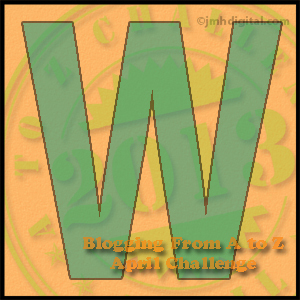 We’re winding up the A to Z blogging challenge and this first day of the weekend landed on “W.” Lot’s of great “W” words come to mind: women, worry, weariness, winsome, wobegone, wanton, whacky and wasted. All great W topics, but alas none inspired me tonight. In fact I’m feeling rather uninspired and really don’t know what my fingers will write tonight. Pondering on the letter “W” again I’m reminded that “W” in and of itself is kind of a weird letter. Think about it a second. As my “why” daughters pointed out to me the day, the letter “W” sounds like double “U”, but looks like double “V.” Why is that? they ask. Why indeed? Good question, but I have no idea why. My girls ask my oddball “why” questions like that all the time. Yesterday we were in the Subway drive thru waiting for our food. My oldest starts wondering about the building. I am glad my girls are curious and encourage them to ask questions. I want them to know more about the “wonderful world” around them, but some days they really exasperate me with their never-ending interrogations. Lucky for them, when I don’t know, they don’t have to thumb through an encyclopedia to find the answers. They don’t even have to go to the library, flip through a card catalog and then use the dewey decimal system to find a book that might have the answer. They have the miracles called “Google” and “Bing.” Two seconds, a couple of clicks and presto they have hundreds of answers to choose from. That’s pretty incredible if you think about it. The Internet makes my life as a writer a lot easier too. I can research without even leaving my bed. That’s powerful. That’s knowledge waiting to be grasped. Wow! Oh yeah, I’ve gotten that one already too and used the tried and true, ‘because’ only to get ‘because why?’ Just because! oh yeah – I’ve used that one too, even though as a kid I promised I’d never say that to my kids!